Onshape is still being developed at a breakneck pace, and since I started writing this article there are now a number of new features related to curves including the option to directly create splines in 3D. I’ll start, though, from the ‘traditional’ way of creating curves in Onshape — by creating them in a 2D sketch and then lofting/extruding/etc. — and I’ll briefly mention 3D curves later in the piece. There’s a lot of mathematical jargon around splines and polynomials, so I’ll try to use both the technically correct terms and plain English where possible. A spline is a piecewise polynomial. The curve is made up of one or more pieces, where each piece is a polynomial. The polynomials are normally chosen such that they “match up” at the transitions and you end up with something that looks like a single continuous curve. There can be various definitions of “matching up”, however to produce a visually smooth curve, at least the function values and the first derivative need to match (C1 continuity), and usually the second derivative is also chosen to match (C2 continuity). The explicit form can produce, say, a parabola y=x2, but can’t produce a parabola rotated by 90 degrees. Therefore it makes little sense for software such as Onshape which must be able to produce curves in any orientation. The implicit form is the most powerful, in that it can express curves that can’t be expressed in the other two forms, but it is difficult to evaluate the set of points that are part of the curve. Therefore, as might be expected, Onshape curves are of the parametric type: a curve in two dimensions is produced parametrically by evaluating functions x(t) and y(t) for t from 0 to 1. The functions x(t) and y(t) are splines: there may, for example, be one polynomial piece from t=0 to t=0.5 and one from t=0.5 to t=1. Some of the FeatureScript functions related to curves, such as evEdgeTangentLine() and evEdgeCurvature(), take this parameter t as an argument. Note that I’ve specified a startDerivative and endDerivative that specify the starting and ending direction; if I had only specified a start and end point then the result would have just been a straight line. But what does the magnitude of these vectors actually mean? It all becomes clearer, however, when you consider the curves in parametric form as described in the previous section: x=f(t) and y=f(t). It turns out that the given derivative vectors are the derivatives of (x(t), y(t)) with respect to the parameter t (i.e. (dx/dt, dy/dt)) at t=0 and t=1. 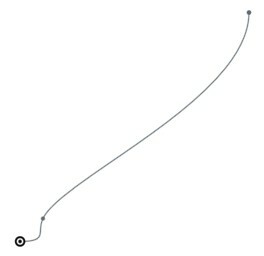 If this is too abstract to visualize, there is also a simple mapping to Bézier control points that I’ll explain below. It turns out that the start point and end point, and the two derivative vectors – four (x,y) pairs in total – uniquely define the eight parameters of the parametric cubic polynomial. Thus, any parametric cubic polynomial can be specified in this way. If you don’t specify the derivative at the start point or end point, the second derivative at that point is set to zero, which is sufficient to provide the missing constraint on the polynomial. If you are familiar with Bézier curves the above discussion will sound familiar. 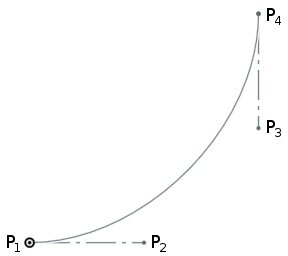 A Bézier curve is defined by four control points (call them P1, P2, P3, P4). The curve launches from P1 in the direction of P2, and then approaches P4 from the direction of P3. If P2 is further away from P1, then the curve launches with more momentum in the given direction. where Δt will be 1 for the simple case that t varies from 0 to 1 across the curve segment, and the 3 arises from the degree of the polynomial (because d/dt(t3) = 3t2). 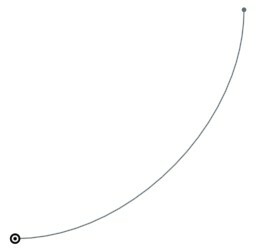 Thus, for a single-piece spline, the startDerivative and endDerivative will be three times the distance to the corresponding Bézier control point. You can evaluate the spline at any point using the evEdgeTangentLine() function in FeatureScript, providing the parameter value t (from 0 to 1). The Line object that is returned has an origin that provides the evaluated point and has a direction that is tangent to the spline. This can be useful for performing further geometry calculations after drawing a spline. For completeness I’ll note that there is also a evEdgeTangentLines() function — which is identical but allows evaluating the curve at multiple points in one call — and an evEdgeCurvature() function — which returns not only a tangent but also normal and binormal vectors. Now there are two polynomial pieces, one that goes from (0,0) at t=0 to (10,10) at t=0.25, and one that goes from (10,10) at t=0.25 to (100,100) at t=1. The breakpoint between the two – called a knot – is at t=0.25. Why is the knot at t=0.25? Well, this knot could actually be placed anywhere in ‘t space’, for instance t=0.1 or t=0.5, but as the second piece of the curve is much longer there is an argument for assigning more ‘t space’ to the second piece. Onshape uses the square root of the chord length between points as the metric; the lengths of the two chords here are 14.1m and 127.3m so the knot location is chosen as sqrt(14.1m)/(sqrt(14.1m)+sqrt(127.3m)) = 0.25. … where I’ve calculated the required piece1 endDerivative and piece2 startDerivative so that both first and second derivatives match at the joining point (10,10). Note that all of the derivatives end up scaled when splitting the curve, as they are derivatives with respect to t and t is no longer the same variable (now each piece has t from 0 to 1). As a corollary, if you only care about first derivative continuity and not second derivative continuity, then you can actually get a larger variety of curves by drawing the two parts individually: then you can choose any value for the piece1 endDerivative and piece2 startDerivative as long as the direction matches. Actually Onshape represents all of these splines in terms of B-splines rather than as an array of polynomial co-efficients a,b,c,d,e,f,g,h for each piece. Contrary to popular belief, there is nothing voodoo about B-splines, they are just a tool for expressing splines in a more convenient form. The basic idea is that we can separate a spline function into a set of control points c, which define an approximate path for the spline, and a set of functions b(t), which give the weighting of each control point at a parameter value t along the curve. 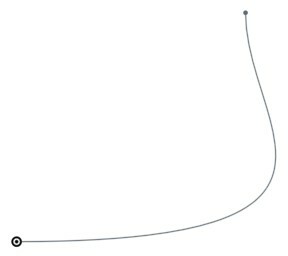 The spline may not pass through all or even any of the control points c, but moving the control points allows you to control the path of the curve. b(t), which weights the control points, is chosen such that it has a number of nice properties. The sum of components in b(t) should always be 1 for any t, which is required for scale-invariance (i.e. if you scale up the control polygon c, the spline should scale with it). Also, b(t) should be smooth everywhere (i.e. continuous first and/or second derivatives), such that s(t) is smooth everywhere. A suitable function b(t) can be generated using what’s called the Cox-de Boor recursion formula. The only input to this algorithm is an ordered list of t values called knots – these are transition points between a set of underlying polynomials used to construct b(t). 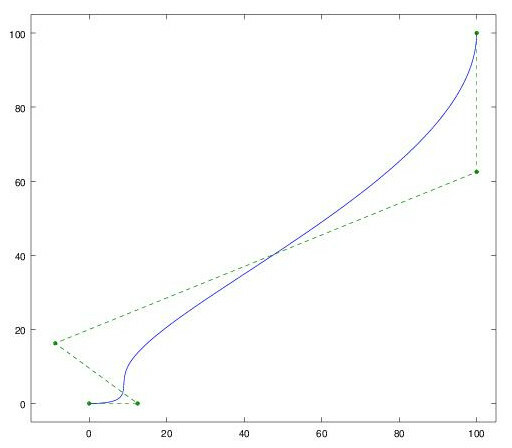 In other words, at t=0.5, the five control points of the spline are weighted according to this vector. 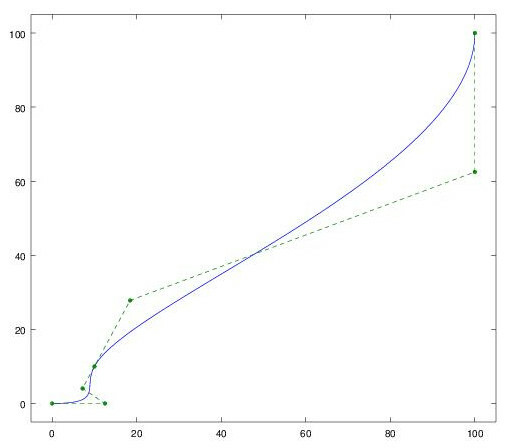 Notice that here (and in fact anywhere beyond the first knot at t=0.25) the first control point has no effect; this is a B-spline property called local support. I’ve failed to explain something. It makes sense that the knot locations are at t=0,0.25,1, which corresponds to the pieces of the spline, but notice that I’ve repeated the t=0 and t=1 knots four times on line 2. This is called knot multiplicity. In order for the spline to be “clamped” to the first and last control points, these knots must be repeated at least n+1 times (where n is the degree of the polynomial). A picture that illustrates this can be found on this website. Note that the control points are not the same as the points you specify to skFitSpline(). 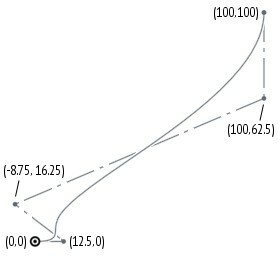 In this example, the specified points to skFitSpline() were (0,0), (10,10), (100,100) with startDerivative of (150,0) and endDerivative of (0,150), while the corresponding spline control points are (0,0), (12.5,0), (-8.75,16.25), (100,62.5), (100,100). How did I arrive at these control points? The first and last fit points become the first and last control points. The second and second-last control points can calculated from the startDerivative and endDerivative using equation set 1. The other control points are derived from the remaining fit points with linear algebra, using equation 3. Note however that however this is not a public API and subject to change, so it’s better to use skFitSpline() where possible. If you want to define a spline using control points, you can easily convert it to skFitSpline() form by evaluating it at all of its knots, and calculating the startDerivative and endDerivative using equation set 2. It can be seen that the B-spline form of a spline has a number of advantages over specifying polynomial co-efficients for each polynomial piece. Firstly the control points have a more intuitive geometric interpretation than the polynomial co-efficients. Secondly, if b(t) is chosen to have second-derivative continuity, then s(t) automatically has second-derivative continuity without needing to fit a set of co-efficients that satisfy this criterion. However there is nothing magic about B-splines: you can calculate the polynomial co-efficients from the B-spline control points, and vice versa, so they are just different representations of the same curves. Note also that for a single-piece spline with a simple knot vector like [0,0,0,0,1,1,1,1], b(t) is exactly equivalent to the weighting that defines a Bézier curve, and the resulting spline is the same as the Bézier curve with the same control points. More complicated splines can be decomposed into multiple such Bézier pieces. So again there is nothing more or less powerful about these splines versus a set of Bézier curves joined together; however the B-spline representation requires less control points for the default case that second-derivative continuity is desired. I’ve uploaded the code for bsplineinsert.m to my GitHub along with some other B-spline utility functions. 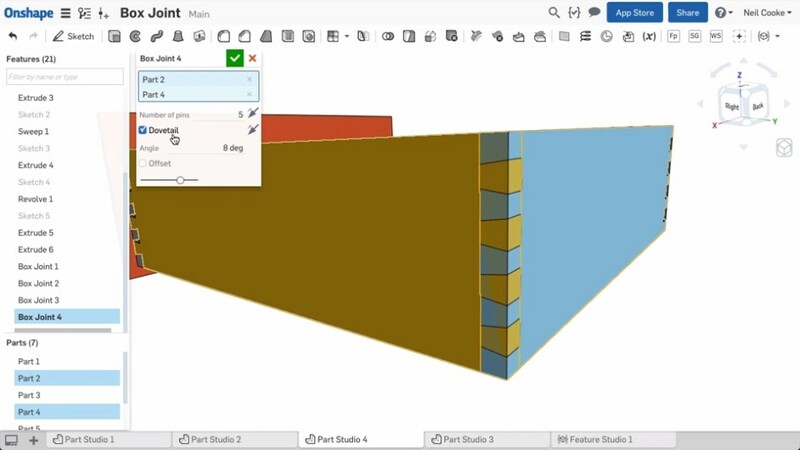 Hopefully in this instalment you’ve learnt a few things about splines and how they can be represented in Onshape… I know I have. In part 2, I discuss offset splines, derivatives of splines, creating splines directly in 3D, and some other tidbits about Onshape internals. There is a FeatureScript forum that might enjoy a repost of this article. Thanks! I’m planning to post on the forum when I finish part 2 🙂 Hats off to the team at Onshape for creating such a neat product – there was definitely a ‘wow’ moment when I first saw it, and another ‘wow’ moment when I started playing with Featurescript. 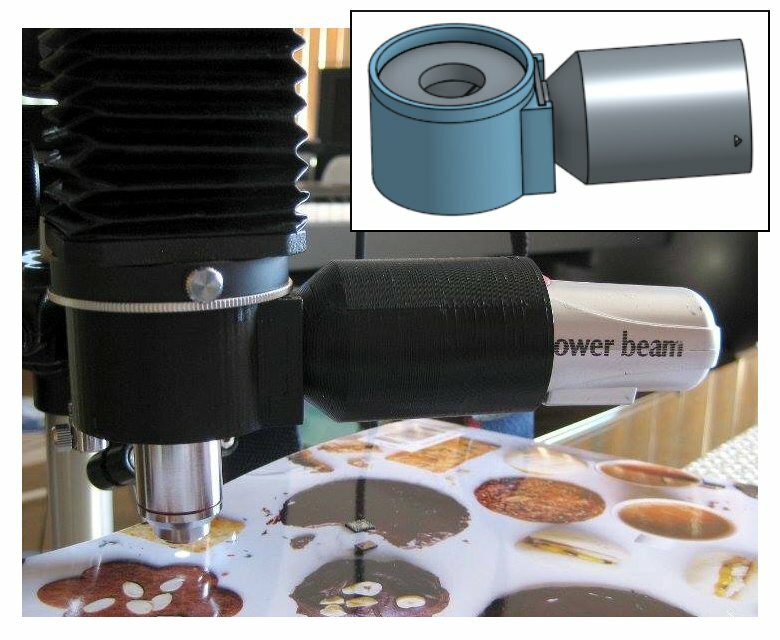 Thank you also for letting us hobbyists play with it in our personal projects for free, I think it’s a great way to build a community around the product, and I’ll know where to turn when I need CAD for work in the future. Yes you can create rational Bézier cubics and rational B-splines using the opCreateBSplineCurve function described in part 2.